This page is for assistance only. There is no implied warranty or guarantee from us that there will not be freeze damage to your system under any circumstances. If there is an impending hard freeze coming and your system is currently "on" (not winterized), here is what to do. - Shut off your sprinkler system's water source, usually in the basement or crawlspace. To the right (above on mobile) are some examples of what sprinkler shutoff valves look like, to help you locate yours. You are looking for the SPRINKLER SHUTOFF, not the house's main water shutoff! For round handles, use “righty tighty, lefty loosy” principle. For levered handles, make the handle perpendicular to the pipe. - Have a bucket ready near the shutoff valve inside. If you have someone else handy to hold the bucket, you can do STEP 3 now. If you are doing this by yourself, you can wait and do this part after STEP 2. If you have a helper to wait inside while you go outside, you can OPEN THE DRAIN CAP now. WATER MAY NOT COME OUT YET, since the water will be suctioned in the pipe until you go outside. If you're by yourself, skip this for now and you'll do it as Step 3. While water not drain out just yet, it will once you do the next step, so be ready! 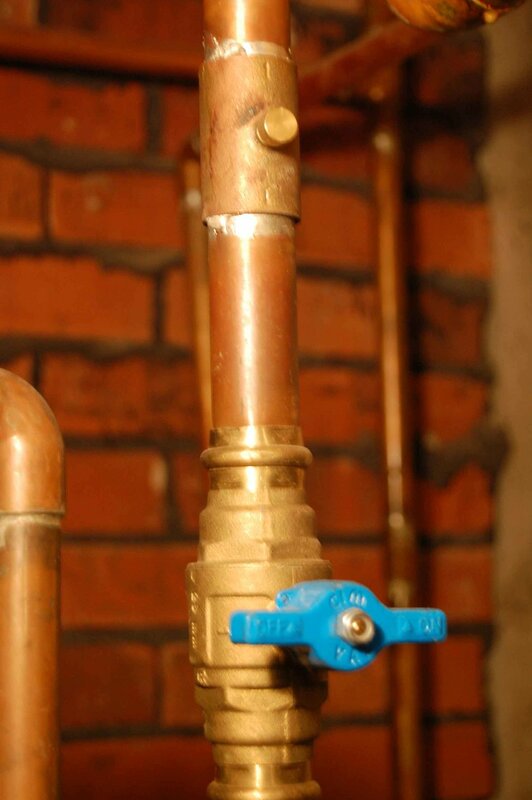 - Locate your backflow valve (some systems may not have one). This is usually right outside the house, anywhere from one to five feet above the ground. The pipe from the shutoff valve (pictured right or above) will run through the wall of your basement to the outside, leading to your backflow valve. 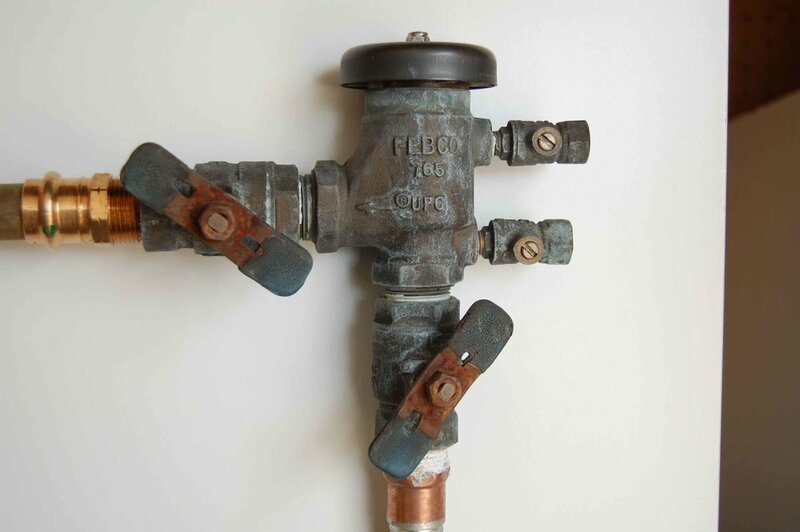 Below are some examples of what your backflow looks like in the on, or summer, position. Handles are parallel to pipes and petcock screws are perpendicular in the summer, when you're running your system. One extra step that some people like to do is to open the drain in your valve box, or "manifold box" (usually in the ground with a green lid on top). Many valve boxes DO NOT have drains. The drain handles look like a metal "X". This is only necessary if temps stay below freezing for several days. Late fall and early spring freezes typically will not do any damage to your box in the ground (the ground is warm at this point and will keep everything thawed in the box). - If you haven't already done so, open the drain cap in the basement. Water will pour out of the pipe in the basement, so have a bucket or something to catch it! Keep you drain cap OFF and put it in a bag or safe place. Water will drip for 15 minutes or so. If it does not stop dripping, this could mean that your shutoff valve is leaky, or that you've not turned the water off enough. - Run a cycle on your timer for a few minutes - any zone will do. The zone valve in the ground will open and allow gravity to drain more water out of your above-ground pipe and backflow valve. 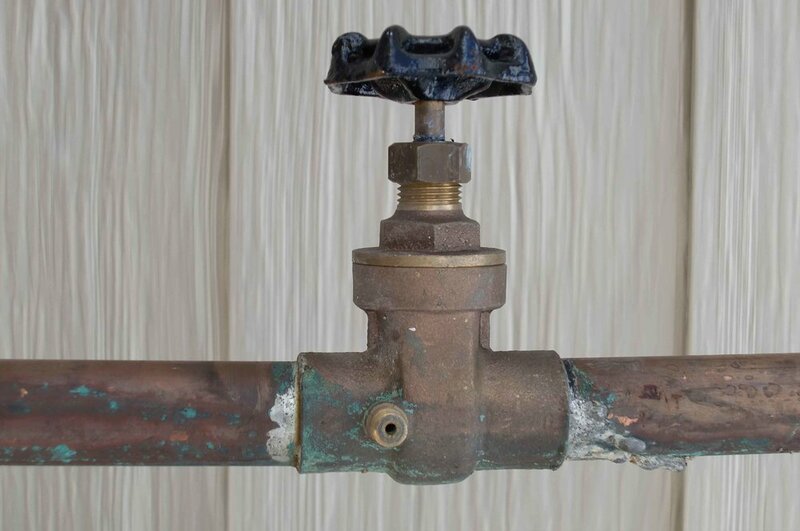 No heads will pop up because you have already turned off the water, but this ensures that any remaining water in the exposed pipe will drain to ground level. Turn off your sprinkler timer.